Официальная премьера новой модели S-серии состоялась на автосалоне в Детройте — для США в Subaru сделали седан STI S209 и это первая машина S-серии, которую продают за пределами Японии. Заявлено, что будет сделано всего около 200 экземпляров новинки. Седан получит 2,5-литровый оппозитный турбомотор мощностью около 341 л.с. Такой отдачи удалось добиться за счёт нагнетателя HKS с более высоким давлением, кованых поршней и шатунов, обновлённой системы впуска и впрыска воды в интеркулеры, нового топливного насоса, более эффективных форсунок и более лёгкого выхлопа с меньшим сопротивлением. S209 доступна только с 6-ступенчатой механической коробкой передач вместе с фирменным полным приводом, который был перекалиброван для специальной версии. Кроме прочего у STI S209 новый обвес кузова — машина стала шире, что позволило увеличить колею и поставить более широкие покрышки Dunlop GT600A на 19-дюймовых дисках BBS. Для улучшения управляемости на седан установлены новые амортизаторы Bilstein с более жёсткими пружинами и задний стабилизатор поперечной устойчивости диаметром 20 миллиметров. Были усилены и подрамники, а также кузов. Для уверенного торможения машину оснастили мощными тормозами Brembo. В салоне появились новый руль и сиденья Recaro с серебристым декором. Всего будет сделано не больше 200 машин, которые появятся в США к концу 2019 года. Интересно, что из-за большого объёма доработок новый седан был сертифицирован не как Subaru, а как STI — так что речь идёт об STI S209, а не о Subaru STI S 209.
undergoes final assembly in Kiryu, Japan, where it receives engine modifications and bodywork alterations that in total require it to be homologated for the U.S. by STI; thus, the S209 is considered the first “STI-built” Subaru sold in the U.S. 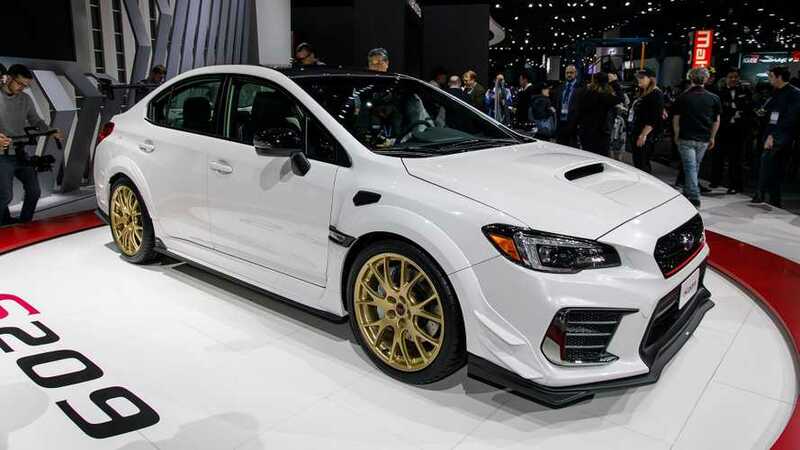 The S209 carries on a high-performance tradition that dates to STI-built models that were exclusive to the Japanese domestic market – the 2000 S201 through the 2018 S208. 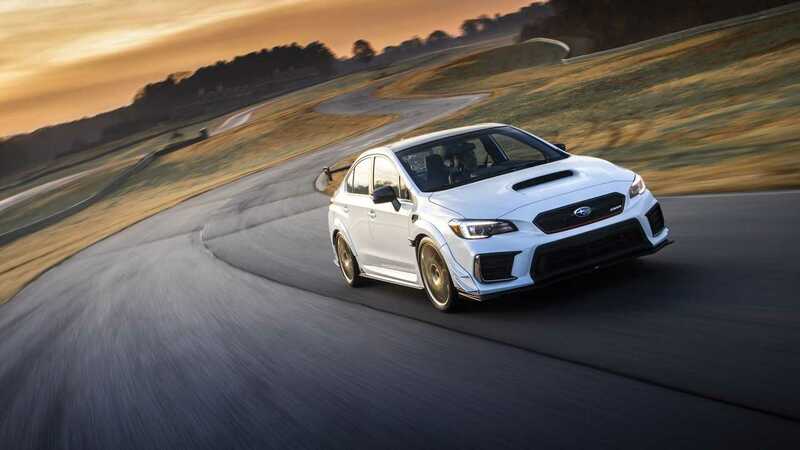 Designed with a focus on high-performance driving, the S209 draws inspiration and tech transfer from STI’s most formidable track machine – the WRX STI Nürburgring Challenge racecar, which won the SP3T class at the 2018 24 Hours of Nürburgring, marking the fifth time STI dominated the SP3T class at the grueling endurance race. 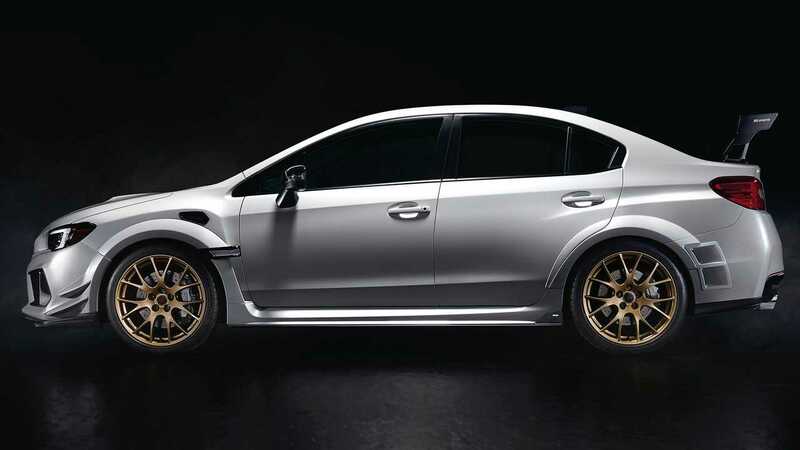 The S209, like the Nürburgring Challenge racecar, wears an expanded wide-body exterior treatment, which extends the vehicle’s overall width to 72.4 inches, or 1.7 inches wider than a standard WRX STI. The bulging fenders accommodate wider front/rear tracks (+ 0.6 in front/rear) and 265/35 Dunlop GT600A summer-only tires wrapped around lightweight 19 x 9-inch forged BBS alloy wheels. The all-new tires, developed exclusively for the S209 by Dunlop, are a significant contributor to the car’s tenacious maximum lateral grip of over 1.0 g. Vents on the front fenders provide additional engine cooling, while vents on the rear fenders rectify air turbulence to reduce drag. Brembo brakes, with cross-drilled steel rotors and 6-piston monoblock front calipers and 2- piston monoblock rear calipers, provide stout stopping force, thanks in part to upgraded high- friction pads that deliver improved fade-resistance. Underneath the S209’s broader body are specially developed Bilstein® dampers, stiffened coil springs, a 20mm rear stabilizer bar and pillow-type bushings for the front/rear lateral links. The S209 incorporates reinforcements to the front crossmember and rear subframes and, a la the Nürburgring racecar, a flexible front-strut tower bar and flexible front/rear draw stiffeners. The flexible tower bar, unlike a conventional rigid bar, is split and joined with a pillow ball joint in the center to be longitudinally mobile while helping laterally stiffen the body of the car. The result is optimum tire grip during lateral moments combined with compliant ride during longitudinal moments. Meanwhile, the draw stiffeners apply tension between the body and cross member to optimize chassis flex, improving stability when cornering and delivering better ride, handling and steering response. Other Nürburgring racecar tech that trickles down to the S209: front, rear and side under spoilers; front bumper canards; and carbon-fiber roof panel and rear wing. To feed more air to the EJ25, the S209 uses a high-flow intake system featuring a new intake duct, induction box with conical air filter, silicone turbo inlet duct and, a nod from the 2004-07 WRX STI, an intercooler water spray system that lowers intercooler temperature via manually operated steering-wheel paddles. More air demands more fuel, so the S209 receives a new high-flow fuel pump, larger fuel injectors and an STI-tuned engine control module. High- performance mufflers deliver 17-percent less airflow resistance and shed approximately 4.1 pounds. Finally, larger hand-polished stainless-steel exhaust tips – 101mm in diameter – deliver aggressive appearance and acoustics.